2006 was a good year for music – every month, it seemed, there was a new album to listen to endlessly. Some bands followed up promising albums with even better ones, like the Hold Steady’s Boys and Girls in America, or Phoenix’s It’s Never Been Like That. Others followed up with less than great albums – as much as I was looking forward to the Magic Numbers’ new album, it just couldn’t get into it. Most of all, each album soundtracked a little bit of my year; inside are three of my favorite albums from 2006 – if you missed any of these, check them out and let me know what you think. I saw more concerts in 2006 than ever before – a great lineup of bands came through San Francisco (and I managed to be in town for them!). Some were lively and fun (The Decemberists at the Warfield), while others were disappointing (The National at the Great American Music Hall); two short reviews of my favorite shows of the year after the jump. One of my good friends, Greg H, runs zoo-m, and they’ve just launched TimeToMeet after its beta period. 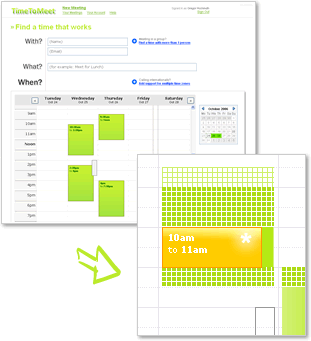 TimeToMeet is a beautifully done webapp that solves a simple, yet recurring problem: scheduling meetings or meet-ups with multiple people’s schedules. It integrates with Google Calendar, iCal and Outlook (and actually enables viewing Outlook and iCal calendars in Google Calendar as an added benefit) and doesn’t require your invitees to sign up – they just follow a link in an email. One nice feature is the ability to set-up a “Personal Secretary” URL so others can schedule time with you of their own initiative; for example, mine is here. The application uses a “painting” metaphor for adding and removing time slots for which you are available. All in all, TimeToMeet really nails the simplicity / power balance, and does so while looking pretty great. Whenever I’m meeting with a student who’s preparing for a presentation – be it for a class or for a pitch to businesspeople – one of my first questions is if you ran into an audience member one week from your presentation, and they’ve forgotten about your presentation except one idea, what should that idea be? As we prepare presentations – and all the assorted multimedia accessories that accompany them – it’s easy to lose focus of the main message we’re trying to communicate in the first place. 10 or 15 minute presentations (especially academic ones) might state their purpose early on (“what I argue is that…”) only to then bury that core nugget in an information avalanche. The next time the idea is even mentioned is when the conclusion rolls around – a rescue operation is attempted: “and as stated in the introduction, I’ve argued that…”. This kind of framing is a sure sign that the presentation isn’t communicating a core idea effectively. I’ve seen the same thing happen with idea pitches to project competitions or investors – the core idea behind a venture is stated in the first 20 seconds, and then only mentioned at the end, while in the middle are details of implementation or strategy that – while important – are meaningless unless they are used to reinforce the idea or story that drives the pitch in the first place. Fixing this problem – in either the academic or business domain – involves a simple realization: every piece of your presentation – audio, visual, rhetorical, etc – should revolve around your core idea. If you’re showing a video, ask yourself: how does this video help the audience understand the focus of my presentation? It may not be an immediate connection, so additional comments from you before or after might be necessary, but the connection should be clear by the time you’ve moved on the next stage. All this may seem like “overdoing it” or beating the audience over the head with the same idea. In fact, it may come off this way to your audience – but not if each piece of information and multimedia you add to your presentation enhances your audience’s understanding of that core idea. So, next time you’re getting ready to put together a presentation, stop for a minute and think: what would I want my audience – who will often be subjected to several other presentations in the week following yours – to take away weeks and possibly months later? New in this version is the ability to look up contacts from selected messages (with the option of adding any entries that aren’t found in the lookup to the addressbook). Shoot me any comments or suggestions. This last summer, I was an intern Program Manager at Microsoft, working down at their Silicon Valley Campus with the PowerPoint/OfficeArt team. It was a series of firsts – first time with my own apartment, having to fend entirely for myself in terms of cooking, first internship, and my first summer in California (I went home to Brazil last year). I didn’t know what to expect, but I was extremely excited – and the summer did not disappoint.